The unofficial national bird of the United Kingdom, the European robin is a compact songbird and a common sight in many gardens, woodlands, and yards, not just in the UK, but throughout Europe. Despite their amiable appearance, however, these members of the Muscicapidae bird family (formerly classified in the family Turdidae) can be very aggressive and territorial birds. Discover more about the European or English robin in this fact sheet! These birds are familiar and plentiful across Europe, and have a distinctive body shape and colors that make them easy to identify. The head is round and the neck is thick, giving the bird a stocky appearance, and the short, straight bill is evenly black. Males and females are similar with an olive brown head, nape, back, tail, and wings. The orange face, throat, and upper breast may be faintly bordered by a blue-gray wash, particularly around the face. The underparts are buff or white with a faint orange wash along the flanks, and the legs are pale. The dark eyes stand out in the face and often give this bird a curious or innocent expression. Juvenile European robins look similar to adults, but are heavily spotted in the first few weeks of life, particularly on the breast. Those spots gradually fade as the birds mature into their full adult coloration. European robins can be easily found in open woodland areas as well as urban and suburban parks, gardens, and yards. This is one of the most common garden birds in Europe, with year-round populations found in much of western Europe as well as the British Isles. The European robin is a seasonal migrant, though a central core of its range remains occupied year-round in the UK and western Europe. Summer populations extend as far north as Scandinavia and west through much of northern Europe, while winter migrants may visit the edge of northern Africa and the Middle East. Despite their friendly appearance and musical song, these can be solitary, aggressive, territorial birds. Populations in the British Isles are generally tamer and may even be fed by hand, but European robins elsewhere are often elusive and shy. These birds will puff out their orange chests in aggressive displays, and when confronted with other robins they may attack and injure their competitors. In some cases, European robins have even been known to attack their own reflections, especially during the spring and early summer when territories are being claimed. 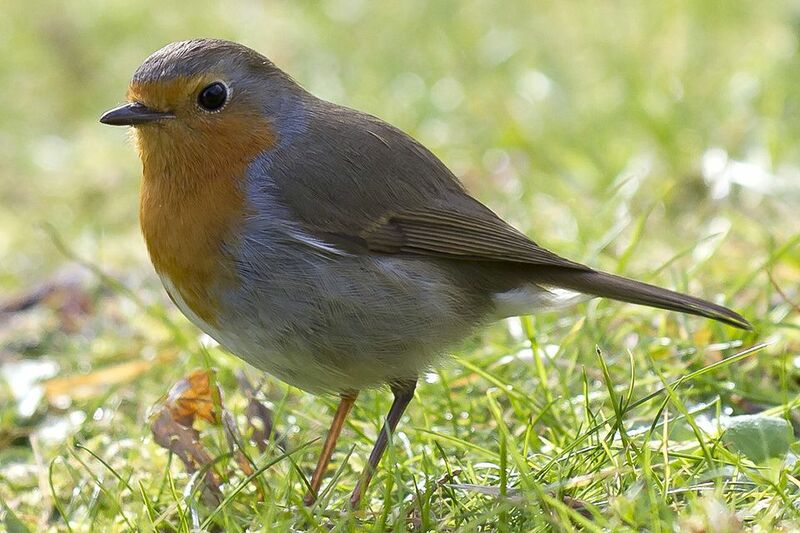 European robins are insectivorous and eat a wide range of insects, including spiders. Worms are also part of their diet, and in autumn and winter, these birds will eat more fruit and berries when insects are difficult to find. While foraging, these robins will often follow gardeners and poke through recently upturned soil in search of tasty bugs. These birds have various courtship behaviors to reduce the territorial aggression and stress between mates. A common ritual is the male feeding the female, behavior that he generally continues through the incubation period as he cares for the female on the nest. Nests are built with moss, grasses, and bits of leaves, and may be lined with fur or down. Nest placement is widely varied, and European robins can nest in many unusual places such as old pots, outdoor equipment, or any convenient niche. A mated pair can produce 2-3 broods of eggs each annually, which must be incubated for 12-14 days. The eggs are whitish, creamy, or buff, and are often speckled or splotched with reddish-brown flecks. Young birds are cared for by both parents for 14-16 days until the chicks are ready to leave the nest. These birds are widespread and not considered threatened or endangered, though some geographic populations are declining. Pesticide controls are essential to protect European robins, and habitat protection and preservation is also vital to give these somewhat territorial birds plenty of space. Illegal hunting and poaching kills billions of songbirds crossing the Mediterranean Sea each year, including these perky robins, and international cooperation will be essential to protect them. These intelligent birds have learned that gardeners turn up soil to make finding worms and insects easier, so they readily come to yards with small cultivated areas. Birders who leave loose mulch and soil available can attract these birds, and European robins will also come to tray feeders offering seed or mealworms. Avoid applying pesticides that may eliminate European robins’ food sources, and consider planting shrubs that yield berries for a winter food source. Suet or fat balls are another great winter food for these robins. Shrubs can also be great nesting sites to keep these robins in the yard year-round. In the British Isles, these robins are widespread and common to see in many parks and gardens. Elsewhere within their range, however, they are more shy and elusive, and birders may need to visit less popular spots where the birds will feel more comfortable and less stressed by too much activity. Established feeding areas offering mealworms, seed, and suet can often attract European robins, giving birders exceptional opportunities to get close, rewarding views of these songbirds. The European robin is the unofficial national bird of the United Kingdom, and is heavily associated with that nation because of the bird's widespread familiarity and popularity in the British Isles. These birds are also closely associated with the Christmas holiday season, and often appear on holiday cards and seasonal decorations. While the European robin may seem superficially similar to the American robin, the birds are not closely related and are members of different bird families. Different scrub-robins, magpie-robins, shamas, wheatears, and Old World flycatchers are closer relatives of the European robin, and they're all worth investigating. Visit all our detailed bird fact sheets to learn about other fascinating species!